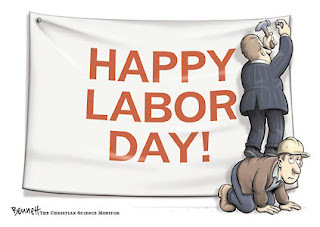 Blog EMAE - Estudio Martin Abogados & Economistas: Labour Day ¿Time to celebrate? Everyone is familiar with the Labour Day. Some people benefit from it and others don't, but everyone usually knows that there's one day of the year dedicated to work. Specifically, this holiday turns around the eight hour day rule, which is followed in many countries nowadays. There should be a double celebration, though. Nowadays, workers around the world are having hard times to find a job or keeping one. As a matter of fact, unemployment (the absence of work) is about to come as famous as the work itself, specially in developed countries. ¿Is it a good time to celebrate? Perhaps it is, maybe it's inevitable in some societies, but we should make a pause a think it through a little bit as well. ¿Eight hours a day? ¿Is it good is it bad? ¿Is it profitable? ¿Is it still good for family matters? There's a big discussion around the eight hours day, specially because some countries around the world don't follow this basic rule. The main argument is that less time at work means more time with the family and that is good for a society. That's a noble idea but to the contrary, if rest equals party, travelling or hanging out with friends, that might be very good for consumption but not for family. Moreover, less work but same wage? Very good for consumption, less good for firm, unless productivity increases as well. Some thoughts to that. The opposite argument is that more hours at work are needed, specially in recession times. In this case, developed countries shouldn't overestimated their potential output and productivity because they're still having very low growth rates. In fact, less qualified work force countries dedicate more time to work, which makes them more productive and having more development each day. On that side of the world, families are not more nor less conflictive than on developed countries. More thoughts to that too. What is the lesson then? More o less work hours? The key element is balance, productivity over time. Which is better, to work 12 hours a day and to produce 120 (dollars, euros or nuevos soles) or to work 8 hours and to produce the same amount of output. Clearly the second choice because the productivity is greater. Of course some might say workers are being exploited for too much work or too many work hours. The key issue, again, is productivity, if the worker is productive it doesn't have too more than the traditionally eight hours; even so, he or she could work less hours, thus having more time free to spend with family. Who is responsible for this productivity? Both the worker and the employer. The first one must realize that in order to have a good work, in terms of hours spent, he or she has to be productive. On the other hand, the employer has to understand that workers has restricted budget and time, and their skills could be improved to do a better work and produce more. That's why you shouldn't be surprised that big companies have this kind of human resources policy. There's one issue, though. Wages. The wealth of a worker doesn't depend solely on the time spent with family, it has to come with a fair wage. What is a fair wage? Economists, some schools of thought at least, understand that wage have to be directly matched with productivity. In Anglo-Saxon countries wages are represented in productivity terms, that is “dollars per hour” or “pounds per hour”. On a technical level it is also accepted in other countries (i.e. France, Spain) but the common knowledge and politicians don't accept it the same way. Lawyers think that the fair wage is the one agreed by the parties, the employer and the worker, and it shall not be less than the minimum wage. Though there could be some penalties or bonuses related to productivity, the wage itself doesn't rely necessarily to it. The labour market is very complicated, even for lawyers and economists, as well as other specialists, but the main idea is that the employer has to value what his or her employee is worth and realize that the value of the wage it offers and the work it demands doesn't have a private effect (the budget of the worker) but two others, a macroeconomic one and social one. And the worker has to realize too that employers don't contract them because of superficial reasons but for the work they are potentially able to do and the wage they receive has to be fairly earn.